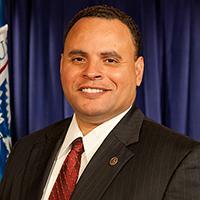 Mr. Alex Amparo is the Deputy Assistant Administrator of the National Preparedness Directorate at the Department of Homeland Security’s Federal Emergency Management Agency, where he is responsible for delivering education, training and exercises to build a culture of preparedness in the United States. His distinguished career in emergency management spans more than two decades at the State and Federal levels. Mr. Amparo entered the Senior Executive Service (SES) in 2011. Prior to his appointment as Deputy Assistant Administrator, Mr. Amparo served as Acting Director of FEMA’s Office of External Affairs from February through June of 2018. In his role as Acting Director, Mr. Amparo restructured the office’s $7.5 million budget, initiated a functional realignment of the office, reenergized a much-needed equipment modernization for the press center, and led the team’s engagement of more than 20,000 stakeholders to raise awareness of the 2018-2022 FEMA Strategic Plan. In addition, Mr. Amparo focused on filling personnel vacancies, boosting internal collaboration and strengthening customer service to Agency components, and ensuring that Office of External Affairs was well-positioned for the 2018 Hurricane Season.